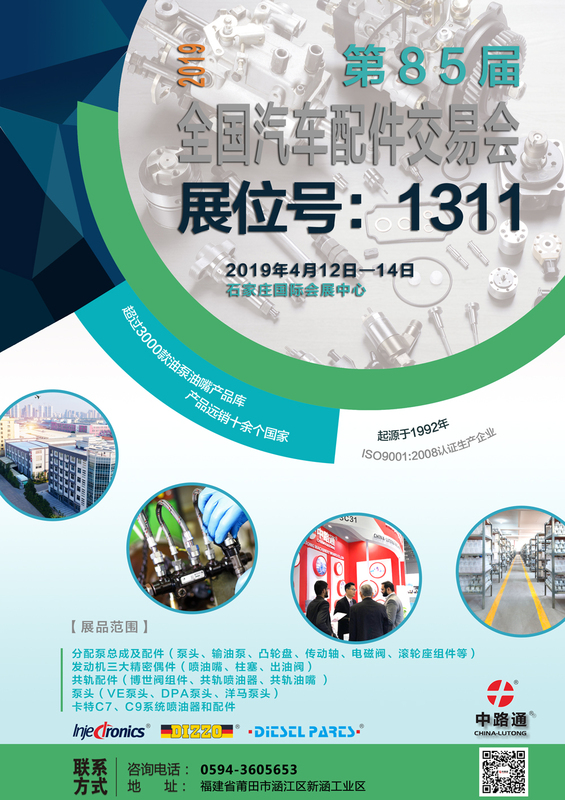 As you are probably aware, China Automobile Parts Fair 2019 is held in Shijiazhuang, China, from Friday, April 12th, 2019 to Sunday, April 14th, 2019 in Shijiazhuang International Exhibition & Convention Center. The 85th China Automobile Parts Fair (CAPF) is the China’s largest exhibition for Automotive Parts & Accessories, China-Lutong is one of the exhibitors this year and I would like to take the time to invite personally you to come and take a look at our booth (Stand: 1311). China-Lutong manufactures Fuel System Parts & Components for Cars, Trucks & SUVs. Whether you are considering fuel injection for industrial use, street rod, off road, marine or Agricultural & Construction Machinery application, China-Lutong has a solution for you. Your presence will surely be of great pleasure to us and we are looking forward to seeing you. ル�`カス��射部品、中国でのディ�`ゼル燃料��射装置部品、ディ�`ゼル��射デルファイ部品、キャタピラ�`、正�の燃料��射部品を中国、燃料��射部品、ディ�`ゼル��射ノズルの部品、ディ�`ゼル��射部品��格は、中国�Zディ�`ゼル��射部品、ディ�`ゼル��射部品中国、ダイハツディ�`ゼル射出部品メ�`カ�`、射出部品、ディ�`ゼル燃料��射部品デシン、卸�鹰钎）`ゼル燃料��射装置部品、ディ�`ゼル��射部品工�觥⒅泄�ディ�`ゼル��射部品、燃料��射部品ル�`カスのDP 210 、ディ�`ゼル燃料��射部品を中国、射出パ�`ツおよび中国、ディ�`ゼル��射部品中国��格は、ボッシュのディ�`ゼル部品、ディ�`ゼル燃料��射部品を中国、ディ�`ゼルエンジンの��射部品、ディ�`ゼル��射部品、ディ�`ゼルエンジンの燃料��射装置部品、ディ�`ゼル��射部品、中国、いす�gのディ�`ゼル燃料��射部品、中国のディ�`ゼル燃料��射部品、 VEの燃料��射部品、デルファイ燃料��射装置部品、ディ�`ゼル��射インド部品、ディ�`ゼル��射部品d4192t （ f8qt ） 、中国のディ�`ゼル燃料��射部品の�u造元、トラックの燃料��射装置部品、ディ�`ゼル��射アメリカ合�\国部品、ディ�`ゼル��射部品、日野燃料��射部品、ディ�`ゼル中国ル�`カスインジェクションの部品工�觥�カミンズ燃料��射部品、中国燃料��射部品、ディ�`ゼル��射中国�u部品、ディ�`ゼル燃料��射部品、射出部品ギリシャ、 MOTORPAL燃料��射部品、ディ�`ゼル燃料��射部品、コモンレ�`ル��射部品.